My name is Pat Wall, and I am living with metastatic breast cancer. I was first diagnosed with breast cancer in February of 1999. I remember thinking this is not like a cold, you treat it and it goes away; no this was not going to go away. 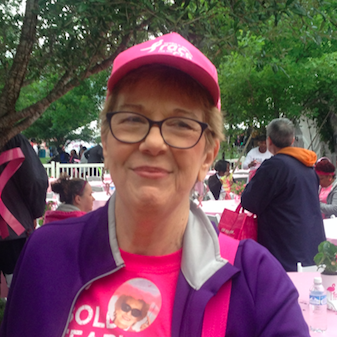 I have walked in every Komen Race for the Cure since 2000. My first year to walk, I thought I was the only one with a story, but I quickly learned that everyone of us has a story. It was overwhelming for me to see all the pink shirts at my first Race for the Cure, but the next year when there were more pink shirts, it dawned on me that there were more pink shirts because more women and men were surviving breast cancer, thanks to the research of places like the Komen Foundation. I walk every year, and hope to live long enough to walk in celebration of a cure for breast cancer or at least a medication that will keep it in control. I do not want anyone else to go through what I have gone through. Several years after my diagnosis, I joined a group called Bosom Buddies. It is a great group of ladies, and we all know what each other has gone through. We are all willing to answer any questions that another survivor might have concerning their treatment or any issues that might arise after treatment is completed. Cancer is not over just because you have finished treatment. Surviving is not easy either, so you need a good support group. After 16 years of being cancer free in March of 2015, I bopped into my doctor’s office for my annual checkup, left the office with the thought that I was glad that was over with until next year. Except a few days later, I got a call from my doctor’s office about a PET scan. A PET scan why did I need a PET scan? My cancer markers were above normal!!!!! !You convince yourself that it is a mistake; that it is something else, but then you get that call that it is breast cancer in your bones and lymph nodes, the exact same kind of cancer you had before. You are in shock and then you get mad. I had been cancer free for 16 years; this could not be right. I did everything I was told to do. I was not overweight, I walked two miles five days a week on the treadmill, I had survived 8 chemo treatments, 26 radiation treatments, had taken Tamoxifen for five years (crying one minute and being happy the next, burning up with hot flashes, etc. ), and had taken Femara for 11 years. What had I done wrong? You have every kind of emotion known to man, but there are no answers. You have to go through treatment again, and this time, they tell you it is not curable. I will be on some kind of treatment plan for the rest of my life. I am on my third medication since 2015, and as of right now, my cancer markers are staying in the normal range or just a little above normal. I walked in the Race for the Cure in 2015 shortly after it had been confirmed that I had metastatic breast cancer; I walked by myself; and I could see the anger on my face in the picture that was taken of me at the finish line. I will walk again this year. When people ask me how I am, I say “I’m hanging in there.” I may not feel good, and it may be hard for me to put one foot in front of the other, but I put a smile on my face and keep going, and I’m going to keep going as long as I can, and I plan for that to be a long time.